Back in December, I asked Kyle the age old question, "What do you want for Christmas?" I was a bit surprised when he answered, "How about a unicycle?" "That's a little out of the box," I replied. 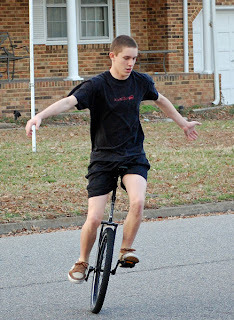 But, sure enough, there was a unicycle under the tree on Christmas morning. It turns out, he's pretty good at it!